I’ve been itching to make this quilt for the past few years since I helped my sister in law make this Christmas quilt way back when. 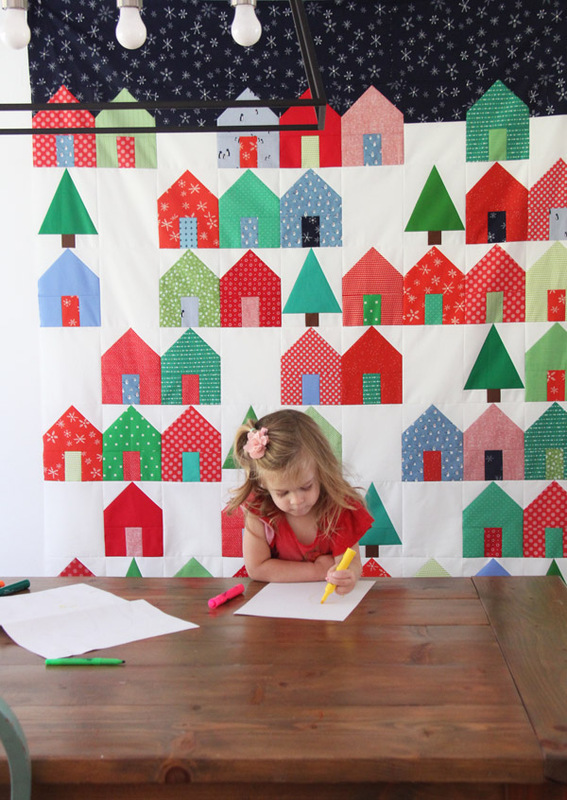 I cut this quilt out on Friday, sewed blocks Saturday, and put the top together Sunday…a fun weekend project! 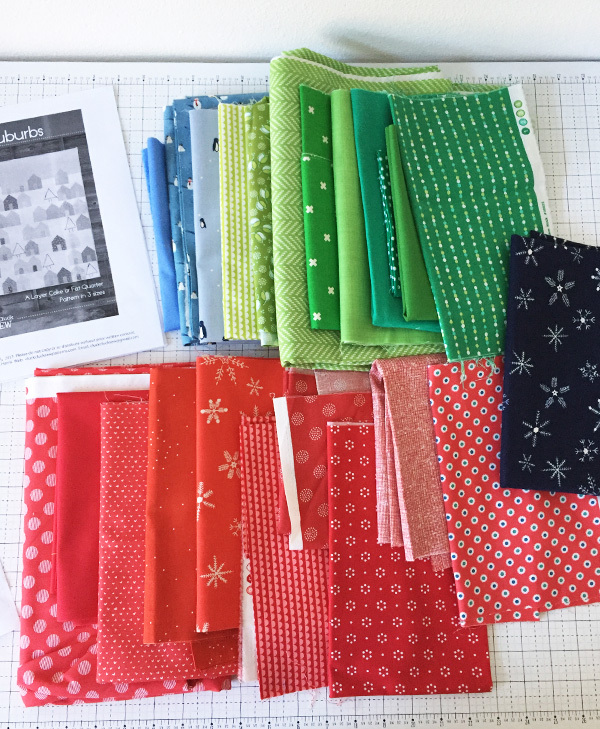 The fabrics are prints I’ve had for awhile, plus the snowflake print for the dark snowy sky I purchased just for this quilt. The pattern is Suburbs. Also of course I added trees! They are so fun with this pattern! I made 8 trees in solids and scattered them throughout the quilt top. 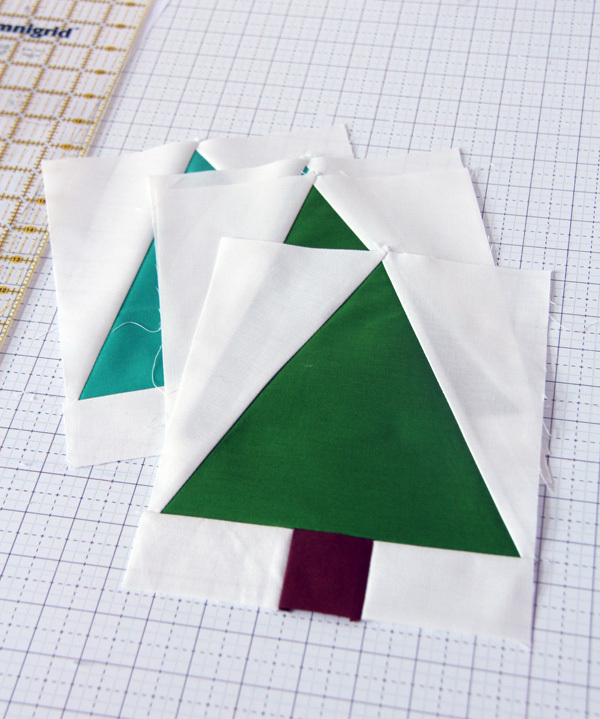 Click the link below for the free Tree Block templates to make your own trees! The Suburbs quilt pattern can be found here as a PDF, or here as a Paper copy. The free Tree Block add on can be found here. Thank – you so much for the tree block ! I have had the Suburbs pattern for awhile now so maybe I’ll get started on it ;) Your latest version is such good inspiration ! Didn’t your SIL sew through her finger making that quilt ? Happy Thanksgiving to your house too. Good memory!! Yes she did sew through her finger…I was teaching her to quilt and she sewed right over it! I felt so bad! This quilt is beautiful – especially love the snowflake print you used for the sky. Thank you for the added tree block pattern. 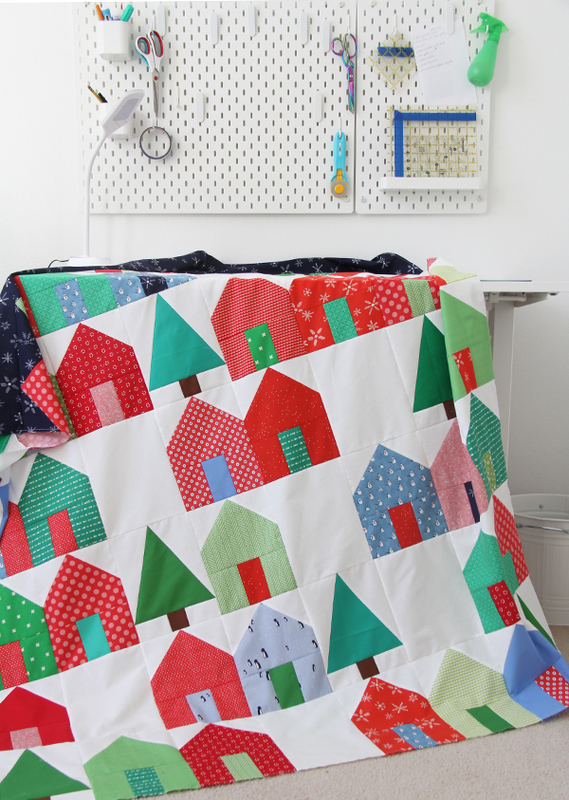 I gifted my first ‘Suburbs’ quilt that I made – now I need to make another. It is a fun a pattern. Thank you so very much for the tutorial and tree block! As always, I enjoy your blog and suggestions. I’ve had Suburbs and I really like this “touch” and Happy Thanksgiving! I’m glad you like it Susan! Thanks for visiting the blog!! Oh MAN!!! Now I need to make ANOTHER ‘suburbs’ but with TREES!!! I guess I’ll make a Christmas one…I LOVE THIS PATTERN! Thanks! Yes you do need to make another one!!! :) THanks!!! Wow, this is SO adorable! I’m going to try to turn this into an eye spy Christmas suburb with fussy cut pieces in the doors. Thanks so much for the pattern discount. That would be CRAZY cute!!!!! What a fun quilt! I love that it could be hung for more than just Christmas. Thanks for sharing the tree block pattern. You’re welcome and I’m glad you like it!! Oh, you clever monkey, adding trees. Love it. 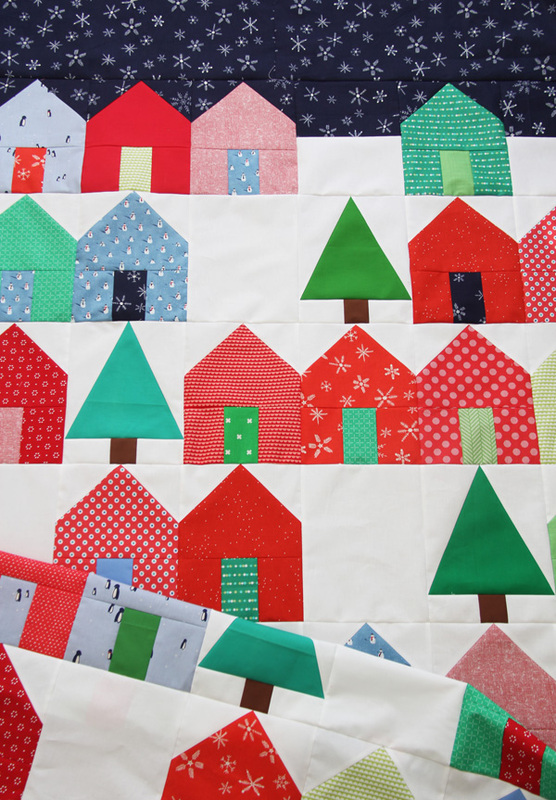 And who doesn’t need another Christmas quilt?! 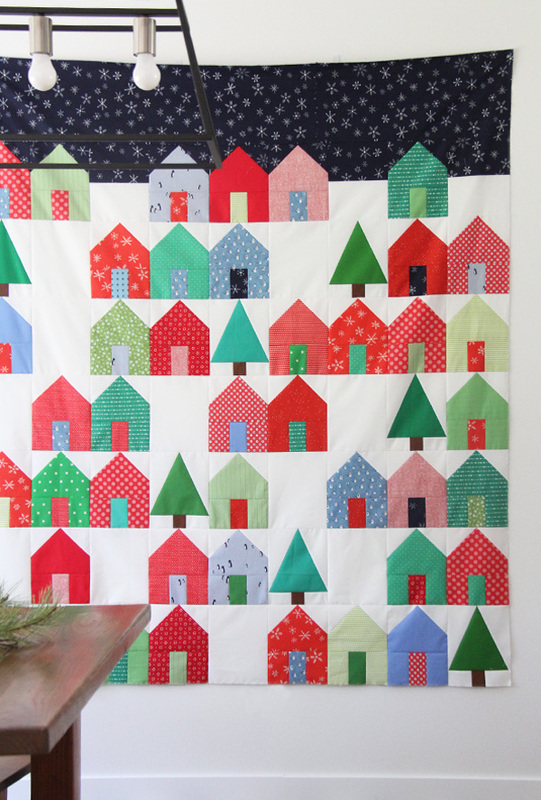 I love this pattern so much…..and those little trees makes it even perfect for your Christmas quilt. Allison I just saw this christmas version which is now on my list of things to do. I also just saw one on pinterest that used halloween fabrics, they added in some extra designs, it’s really cute too. You’ll have to look it up. Thanks for sharing your talents!! My friend and I bought the patterns, and we are collecting fabrics and colors right now! We’ll work on it a lot when I visit her this fall, as it’s going to be Christmas fabrics – or the effect will be – but we have a background we think will work and we’re very excited about your Suburbs! How fun! I can’t wait to see it! !